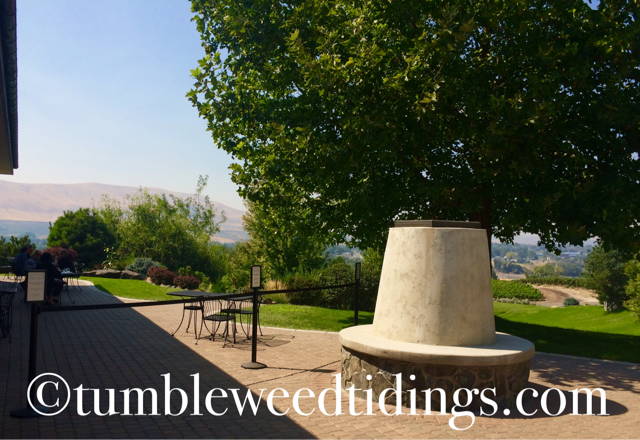 Thank you for taking the time to check in with Tumbleweed Tidings today! Over this Labor Day weekend I hope you and yours had an enjoyable respite from work, school and other obligations, and were able to take some time to relax. Or maybe even have a picnic! 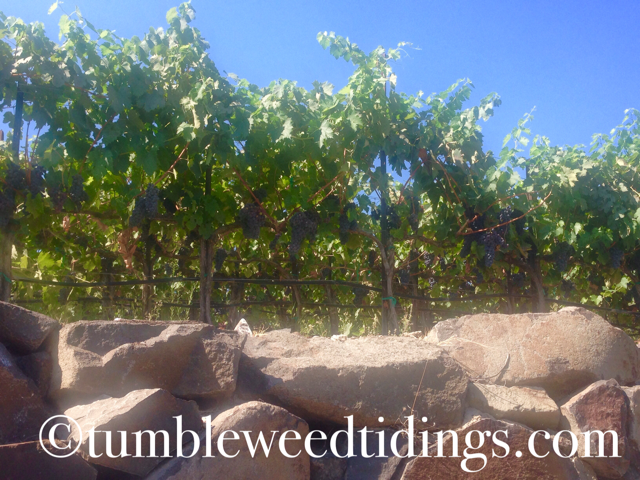 In our corner of Washington State, there are over 300 wineries in the Tri Cities area alone. Additionally, there are several more west of here in the Red Mountain area of Benton City, a mere 20 minutes away. If you go east towards my hometown of Walla Walla, there are over 100 wineries, home to many coveted and award winning wines. In short, southeastern Washington is a major player in the wine industry and it is big business. Wine grapes hanging from the vines at the entrance to Terra Blanca winery. There have been so many times when we have been traveling and find eastern Washington wines on the menu. It is exciting to see how far reaching their popularity has grown, and I’m always a little tickled to find that these wines are special enough to be served in such distant locales. 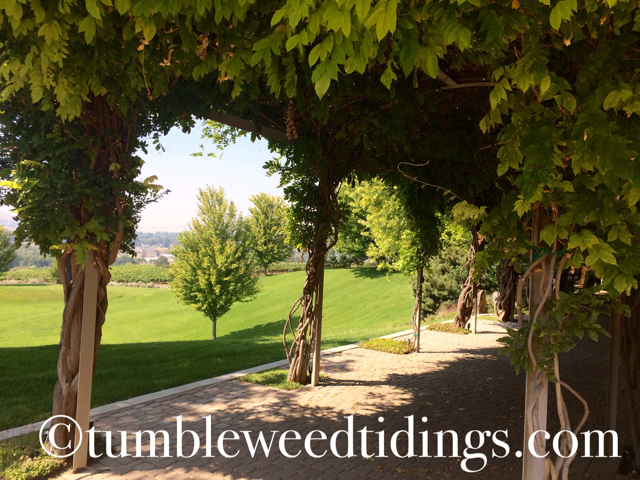 My husband and I are moderate wine drinkers, but enjoy the beautiful winery settings and the feeling of being transported into another place when visiting the many beautiful patios and tasting rooms. While we may only go wine tasting a couple of times a year, it is always memorable. Many wineries also have gift shops and refrigerated cases of items to nibble on, making them a destination for people to gather, taste, eat and shop. Last fall, we participated in an event put on by the Tri City Crime Stoppers called Drink Some Wine; Solve a Crime with several other couples. 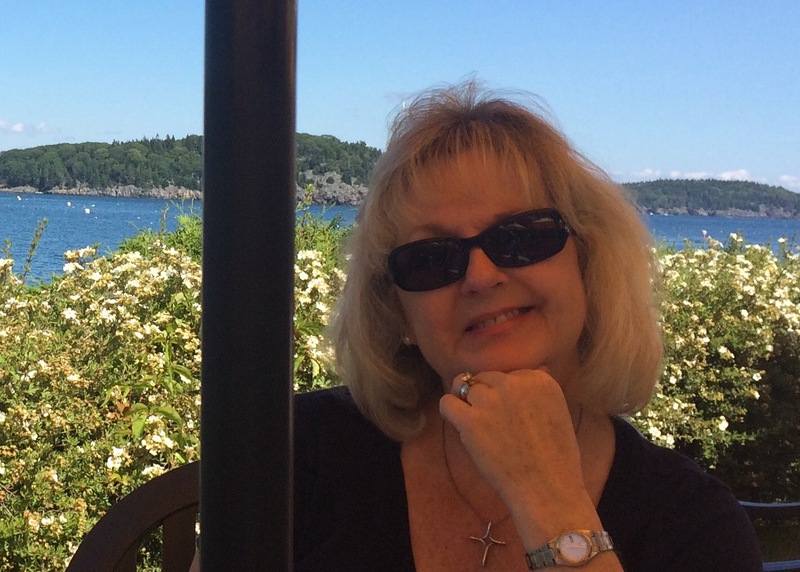 We were bussed to various regional wineries and along the way given clues to a murder mystery. At the final stop in Prosser, we were served an afternoon luncheon, submitted our guess of Who Done It, and were told the solution to the “crime.” All proceeds benefited the local police departments and we got to experience several new and upcoming wineries. In this way, these local attractions can be used as a destination for good causes. Other ways people take advantage of our beautiful wineries is to hire a limo or bus and have a bachelorette party, bridal shower, or anniversary celebration along the way. There are several companies that offer these tours, and “leaving the driving to them” is always a smart idea when going wine tasting. 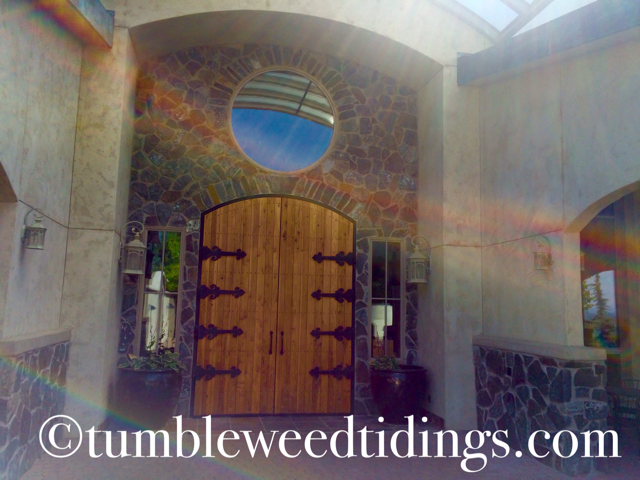 Not a very good photo, but these doors leading into the winery and tasting room are massive. I saw grown men struggle to get them opem! This brings me to my final and favorite way to experience our local wineries. A picnic! 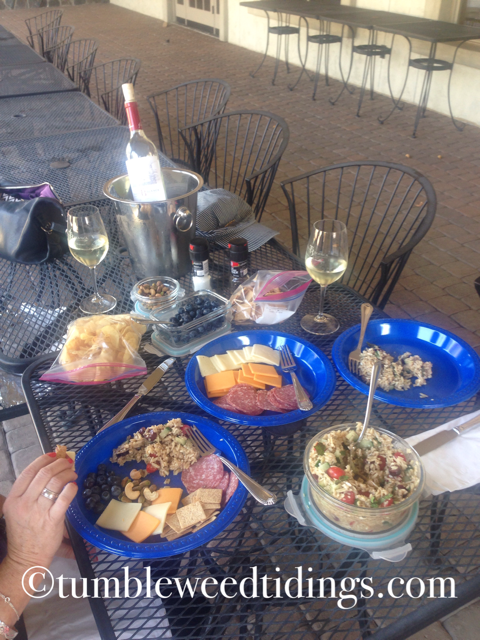 Yes, many of the wineries allow you to pack in a picnic lunch and consume it on the premises. Just check their website ahead of time to make sure, or call and ask. Since most of the wineries do not offer food service, they are more than happy to accommodate. Of course the unwritten understanding is that you will purchase a bottle of wine to accompany your picnic, but that is actually a small price to pay for the ambience they are affording you by allowing you to picnic with them. They brought us beautiful glasses and put the wine on ice. A while back, I took my husband on one of my famous “mystery dates.” (I will explain those in another post someday, I promise.) I packed up a picnic lunch of bruschetta, cut cheeses and meats and a dessert and off we went. 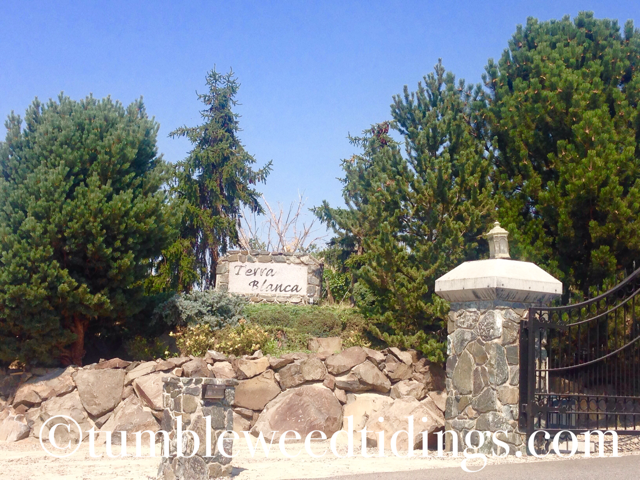 I directed him to Terra Blanca Winery, one of the wineries located on Red Mountain in Benton City that has the most spectacular grounds. 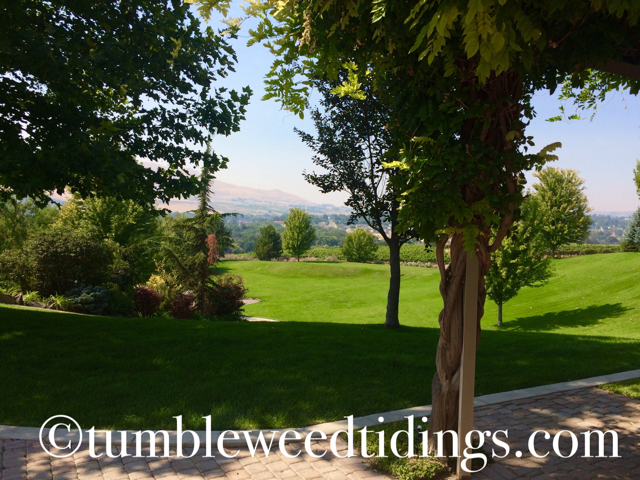 It is so lovely that it is often used for wedding receptions and other private functions. Terra Blanca also has food service, but still allows picnics to be brought in. When we arrived, I told the server that we had brought our own picnic lunch, and she said she would take us to the area on the patio reserved for that purpose. We were shown to a nice table, and treated most graciously. While we brought our own plastic glasses, when she brought the wine we ordered, she also brought beautiful wine glasses for us to use. Because their menu looked so attractive, we ended up splitting their house salad, which was a great accompaniment to our picnic lunch. We had so much fun sitting outside, eating our lunch. 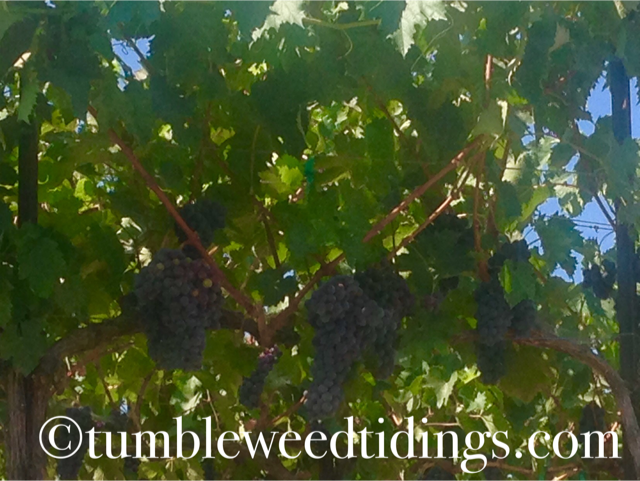 It truly felt like we were on vacation in Napa Valley, rather than only 20 minutes from home. That brings us to this Labor Day weekend. 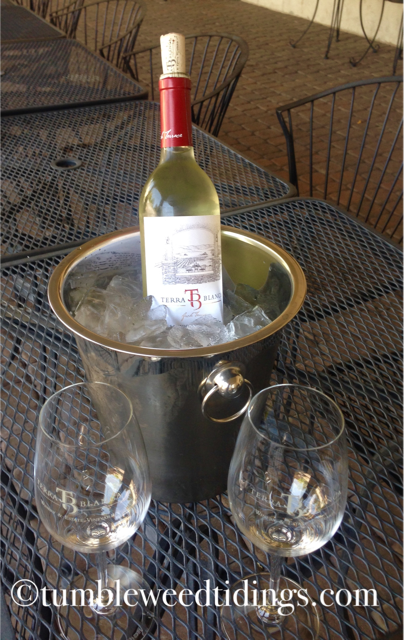 With no set plans, we decided to do a picnic at Terra Blanca Winery again. 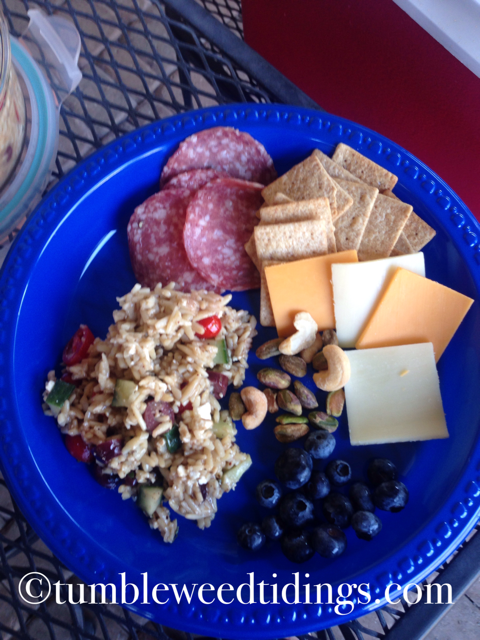 In the morning I made a Greek orzo salad, a salami and cheese plate, chips, crackers, blueberries and chocolate chip cookies. Plates, napkins, silverware, glasses, bottled water and a cooler, and we were on our way. Anyway, it might be high time to bring back the picnic as a way to while away an afternoon. It doesn’t have to be at a winery, but a local park or even your own backyard will work. When I was growing up, my parents owned a restaurant. We would often get their delicious fried chicken and my mother would make all of the other items to go along with it. We would pack it all up and go across the street to the wonderful Pioneer Park, sit at a picnic table near the duck pond and eat our dinner. Less than two blocks from home and it felt like such a fun adventure! A simple antipasto picnic lunch! There is something about changing the locale of your dining that elevates even the most simple picnic food to a whole new level. I’m sure many of you are already doing this, and I would love to hear your menu and venue ideas! So make a picnic and find a nice place to eat outside while the weather still allows. I think you’ll be glad you did. *Disclaimer * I do not work for Terra Blanca Winery or receive any compensation for talking about them. It just happens to be where we went for our most recent picnic lunches. It looks like such fun. Love it. It was fun. We should get a group together and do that this fall…once the air quality improves!